Call it a deliciously different catfish dish, or the expression of our enduring friendship with beloved author and storyteller Kathryn Tucker Windham. 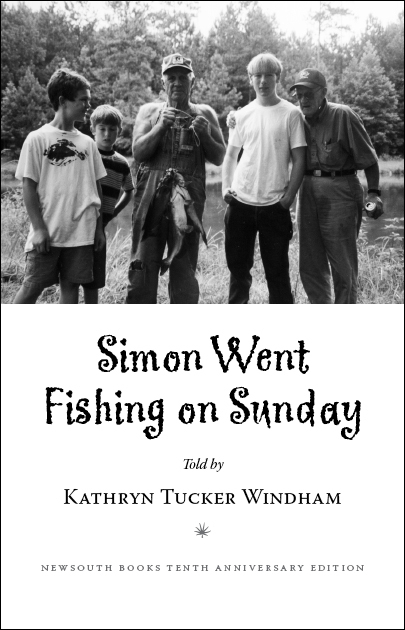 It’s a signed and numbered limited-edition booklet titled Simon Went Fishing on a Sunday, which NewSouth produced on the occasion of its tenth anniversary and the 2010 Alabama Book Festival. Simon Went Fishing on a Sunday was presented to guests at the ABF’s author reception, of which NewSouth Books was the proud sponsor, and the remaining copies are being offered to the public. In all, 150 copies were printed. Only a few copies are left. Kathryn Tucker Windham fans, make note: The catfish is going fast. Visit the Simon Went Fishing on a Sunday page for more details. Rheta Grimsley Johnson’s new memoir Enchanted Evening Barbie and the Second Coming is receiving high praise from fellow writers and rave reviews from newspapers and magazines from Tupelo, Mississippi to Columbus, Ohio. Newly published from NewSouth, Enchanted Evening Barbie is Johnson’s cathartic and introspective look at her life as a daughter of the South and an award-winning writer in a male-dominated newspaper world. You are currently browsing the NewSouth Books weblog archives for April, 2010.